Robert Cheruiyot, winner of the 2007, 2006, and 2003 Boston Marathons, will be back again to race on April 21, 2008. Cheruiyot is seeking to join the ranks of only 3 other four-time male winners, Canadian Gerard Cote and Americans Bill Rodgers and Clarence DeMar. 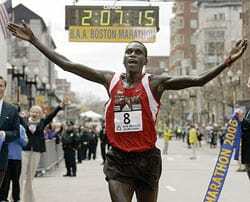 Cheruiyo set the Boston course record, 2 hours 7 minutes 14 seconds, in 2006. His win last year helped him lay claim to the World Marathon Majors series and a $500,000 prize. Cheruiyot said in a press release, "I have had much success on the Boston course because the more difficult and competitive a race is, the more I commit myself to do my best." Update: Cheruiyot won the 2008 Boston Marathon with a time of 2:07:46, taking home the $150,000 purse.